Grow Your Blog Networking Party (I'm Co-hosting!) ~ Diane's Vintage Zest! At the beginning of the summer, I was co-hosting a bunch of link parties to kick off the busy season. It's only fitting that I finish the end of summer off with a bang, and another fun link party! I'm honored that I have the chance to host the last Grow Your Blog Networking Party before they institute the new format. Link up, meet new blogs, and get inspired while you can! 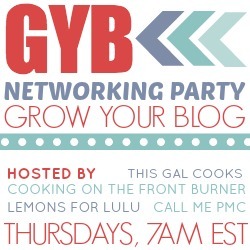 Good morning and welcome to the Grow Your Blog Networking Party. Want to stay up to date with This Gal Cooks? Let's be friends! For the past few weeks your hosts of the GYB Party, Paula, Deb, Tanya and I, have been discussing the fate of the GYB Party. We noticed that the party link up numbers were dwindling and the number of clicks on link ups to the party is less than stellar. This wasn't what we had envisioned with the party. We wanted this party to be a place where other blogs could grow and people could meet new bloggers. While we understand that some of you have done this, we realized that a huge majority of people are not visiting "blog hops" anymore. A lot of people are more interested in recipe, DIY and craft link parties. Paula and I, along with Carrie from Frugal Foodie Mama, host a recipe, DIY and craft party on Marvelous Mondays. That party does AWESOME. The numbers are great, people click on links and people actually get to meet new bloggers at that party. The inlinkz numbers are there to prove it. We've decided that we are going to discontinue the GYB Party. Today's party will be the last GYB Party. We won't be bringing it back in the future. However, the four of us are in the works of developing a new interactive blogging event that will either be a monthly or bi-monthly event. It will involve ingredients and making recipes. And don't worry - if you're not a food blogger, you can still participate. A lot of non-food bloggers love to get creative in the kitchen! We will bring more details to you once we have all of the specifics worked out. This week I am featuring Mary from Back to the Basics. She has so many gardening tips that I could definitely learn from! Follow and/or visit your hosts and co-hosts. Leave a comment on their blog letting them know you stopped by! Leave engaging comments on the blogs that you visit. Invite them to visit your blog. Leave the name of your blog in a comment. Please do not leave a link – Google is going to start viewing links as Spam and they will decrease page ranking of sites that are viewed to have a lot of Spam. Communicate with them about what you like on their blog. Let them know you are interested in their blog. USE THEIR NAME! A simple “I’m so and so stopping by. I followed you please follow me.” just isn’t going to interest someone into visiting your blog. Sure, you can request a visit to your blog or a follow along but engage in some type of conversation first. Place our party graphic on your page. It’s not required but it would be a pretty rad thing to do. You can get the graphic by copying and pasting the GYB graphic located in the beginning of this post.